My children do not really care for chicken and fish in their meals, especially in their school lunches. At school they only have 15 minutes to eat their lunch and often come home with leftovers . 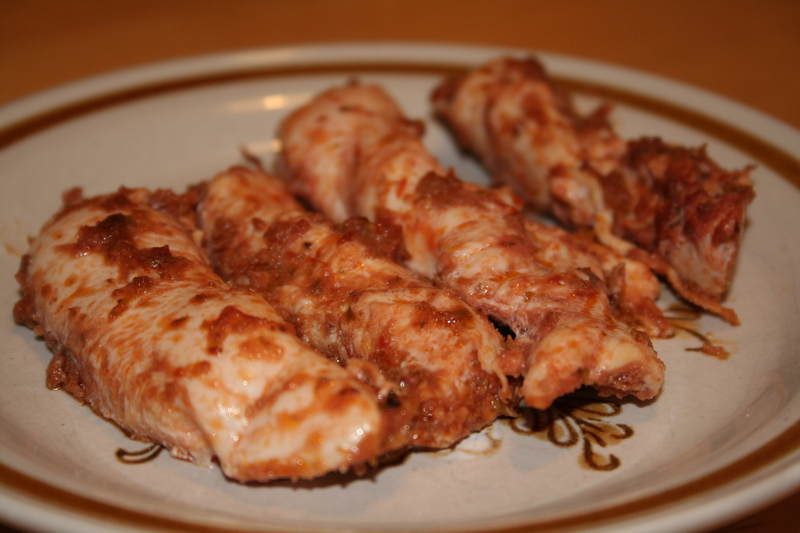 I have been thinking creatively of ways to add fish and chicken to their meals. The fish cutlets are a big hit with them. Since they do not like chicken, I have compromised and have come up with making something with puff pastry. The kids love puff pastry. 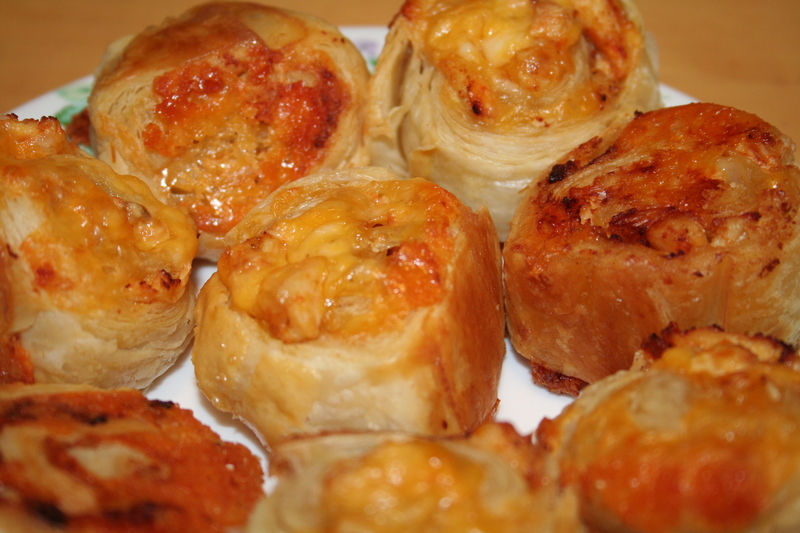 By making a chicken, cheese roll using puff pastry, this meal is quite quick to make and will add some extra protein to their meals. 1. I marinated the chicken with crushed tomatoes and a pesto that I had in my fridge. Feel free to marinate the chicken anyway you like it. Bake at 350 F until cooked, about 15-20 minutes, depending on how big the chicken breast pieces are. 2. Shred the chicken into tiny pieces. 3. Roll out the puff pastry dough until it is quite thin. Keep it shaped as a rectangle. 4. 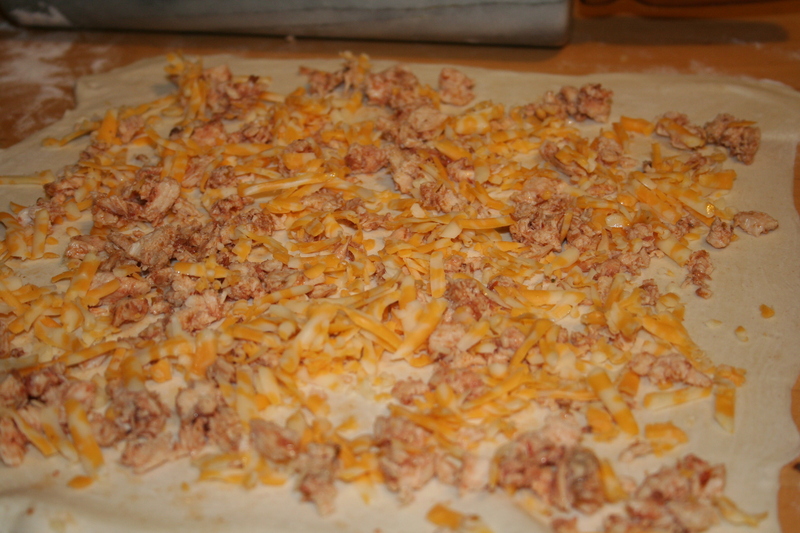 Sprinkle with grated cheddar cheese and the cooked chicken, leaving a 1 cm border all around the dough. 5. Roll the pastry to form a log. Slice the log into 4 cm long pieces. 6. Using a pastry brush, brush on the egg wash (1 egg beaten) on each piece. This will give the rolls a nice golden brown colour when baked. 7. Bake at 400 F for about 15-18 minutes, or until golden brown and cooked through. Serve with a salad. Because of all the cheese in the rolls, my kids did not seem to mind the chicken. These rolls would also make great appetizers. These rolls freeze well. Make a big batch and use them when needed. Enjoy!